Thank you for reading Tuxedo Times! These posts will be every Sunday, recapping the week and any important updates in RF. Events: We started our week off with Project: Rise of US. We had US event called Operation Revival, Our goal was to make US a strong division. We maxed 25+. Well done RF! Click here for the result of Operation Revival. Important Posts: Click here to read about the restoration of law and order by Twitchy, possibly shaping the entire future of the RF. Events: On Tuesday we held 3 Town Of Salem events! To see the results, click here for the AUSIA event, here for the EU event, and here for the US event. Events: Today we had an EU event called Operation Birthday. 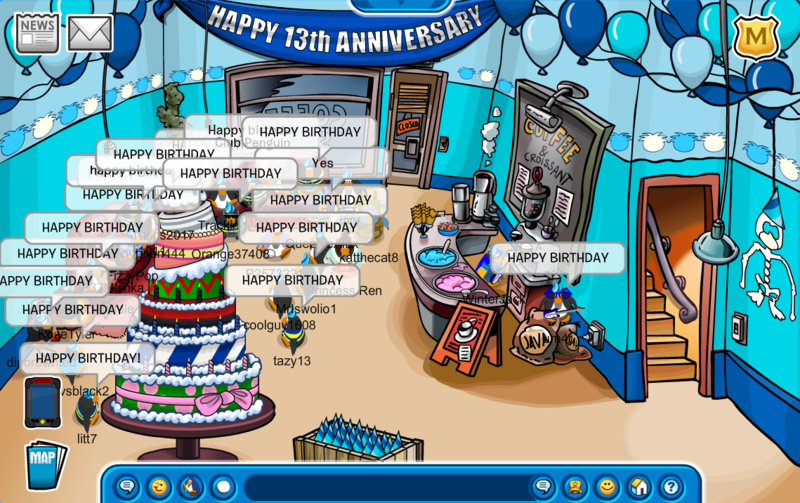 We celebrated Club Penguin 13th anniversary. We maxed 30+. Well done RF! Click here for the result of Operation: Birthday! Important posts: A brand new troop interview was posted! Check it out here. Events: A non-mandatory Trivia night was held as there was a break day from events. Later on an unscheduled US event was lead by the legendary Rebel Commander, Twitchy543. To see the results of this event, click here. Events: We started off Friday with a good ol’ AUSIA event in Operation: Anniversary, where troops fought the good fight wearing anniversary hats around the island. Later on we held the second day of the Rise of US events, and even while on short call, US troops rose to the occasion and showed up to represent the RF in Operation: Ascend. To see the results of the AUSIA and/or US event, click here for the AUSIA, and here for the US, respectively. Important Posts: As the Candy Hunt is underway in CPR, we have made a tutorial post on exactly how to claim all the rewards. (as we do) Check it out here! There was also a brand new Troop of the Week announced! Click here to see who got it if you haven’t already! Events: For Saturday’s events, we embraced our inner animal, as we held Operation Moo-ve It for AUSIA, where troops dressed up as cows as they… well mooed around the island. Later on for our EU event we held Operation Rise and Shine, with troops wearing the Rooster outfit, performing tactics great as usual. Check out the results of the AUSIA event here, and the EU event here. Important Posts: A brand new Halloween party is out on CPR, here’s a post on how to get the scoop on every last detail! Events: We started off the day with Operation Inception as our AUSIA event. This event succeeded in establishing a starting point for the next AUSIA project. Later we had our EU event, which had troops buzzing around for Operation Lucky Ladybugs, with this event maxing over 40 troops. A very impressive number after our switch back to CP events. Some puns were also inevitably made. To see the results of Operation Inception click here. To see the results of this big league, Operation Lucky Ladybugs; click here. Important Posts: Promotions were announced! If you haven’t gotten a chance already, be sure to check out which lucky troops received promotions this week here! • Reminder that there is a new ranking system in place along with a fully renovated constitution. It is highly recommended you read the post along with the full constitution so that you can remain up to date with how the RF functions day to day. Did you know? The oldest man to ever climb to the top of Mount Everest and back down was Yuichiro Miura, an 80 year-old Japanese man, back in 2013. Did you know? California produces around 80% of the worlds almonds. Did you know? The average vocabulary of an adult English speaker is that of about 20,000 words. Did you know? During WW2, the Oscars’ Statuettes were made of painted plaster due to the shortage of metal. Comment below to win 350 Rebel Cash! Click here for RF’s Youtube channel, and here for RF’s Twitter! There’s no way in hell that I count how many roles there are, but hey, nice job everyone! Good post! I counted and its 27 however there’s also Advisor which isn’t really a rank but they’re there.